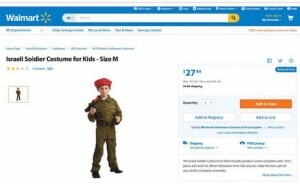 Walmart removed a children’s costume depicting an Israeli Defense Forces (IDF) soldier from its website late on Thursday due to pressure from activists who deemed it "offensive" and "problematic." However, Walmart continues to sell a keffiyeh head wrap that often has been used a symbol of violence and resistance against the Jewish state. The Israel Project, a pro-Israel organization based in Washington, D.C., responded by launching a social media blitz aimed at shaming Walmart and accusing it of not supporting the Jewish state as a result of its decision to pull the IDF costume. The organization’s campaign, which accuses the retail giant of caving "to anti-Israel hate," has attracted 6,000 signatures to a petition urging Walmart to continue selling the costume, according to information provided by the organization. Walmart’s decision to remove the costume comes amid a surge in Palestinian terrorism that has killed several Israelis and wounded many more over the past several weeks. Pro-Palestinian activists have accused Israel of using too much force during the effort to protect civilians from the terrorist campaign. "Israeli soldiers are heroes. They fight every day to protect innocents from terror," the Israel Project wrote on its Facebook page. "But Walmart removed an Israeli army costume from their website. Why? They surrendered to a vicious hate campaign—a campaign to demonize Israel. If you support Israel, you must take action now." "Tell Walmart: Stand up against anti-Israel hate," the petition states. Walmart and other retailers have also removed a costume depicting an Arab individual with an exaggerated long nose. Both that outfit and the IDF costume were removed after pro-Palestinian activists launched a pressure campaign online and elsewhere. The American-Arab Anti-Discrimination Committee, an anti-Israel organization that has come under fire from human rights organizations, described the IDF outfit as "problematic" and claimed that the costume promotes "fear" and "violence." "The costumes are very problematic, and offensive to many people," said Samer Khalaf, the committe’s president, in a statement. "The Israeli forces are responsible for the continued death and occupation of the Palestinian people. Such a symbol of fear, violence and a long history of dispossession should not be used for entertainment purposes." Omri Ceren, the group’s managing director, criticized Walmart for caving to pressure while continuing to sell other items that some might consider offensive. "Palestinian and Arab terrorists have spent the last month stabbing Israelis and Americans in the streets," Ceren said. "Walmart is choosing to feature terrorist costumes but deny Americans the ability to side with Israel. It's disgraceful." Walmart did not respond to a request for comment on the issue.